How does the InvisiVein Laser treat varicose veins? The InvisiVein endovenous laser is ideal for patients diagnosed with abnormal saphenous vein valvular insufficiency. An in-office ultrasound combined with a provider consultation determines if patients have GSV reflux. Typically patients present with bulging varicose veins with associated symptoms including pain and swelling. InvisiVein Laser Treatment (EVLT) uses heat to attack the underlying cause of varicose veins, the abnormal GSV. Leg veins have valves. When those valves don’t close properly, blood flows backwards by gravity towards the feet. The increased pressure and backflow causes swelling which presses on nerves resulting in many symptoms. In our office we use the InvisiVein Laser uses to heat seal the abnormal GSV. If needed, during the same session bulging branch varicosities are then removed through tiny punctures using a minimally invasive ambulatory phlebectomy technique. When performed together the procedures are commonly referred to as EVLT/AP. Procedures take about an hour and are performed in our office using local anesthesia. Is InvisiVein Treatment covered by insurance? Symptomatic varicosity treatment is medically indicated. We work with your insurance company to assess eligibility. In most instances the treatment is covered. For individuals with exclusions or without insurance, we provide a tailored self pay rate based on your treatment plan. What are the advantages of InvisiVein endovenous laser treatment? Before the advent of endovenous treatment for venous reflux, the only options were lifelong compression stockings or conventional surgery using general anesthesia. The process was painful with increased risks and often caused significant scarring. The InvisiVein EVLT is an FDA approved alternative to the more invasive traditional venous stripping. 1. Outpatient procedure usually 60-90 minutes. 4. Greater than 98% closure at 5 years. 5. In most cases, one treatment session for both GSV reflux and varicosities. 8. Covered by most insurance plans including Medicare. 9. Performed by Board Certified Interventional Radiologists. What clinical problems may occur if venous reflux and associated varicose veins are not treated? 6. Staining/discoloration of the skin. 9. 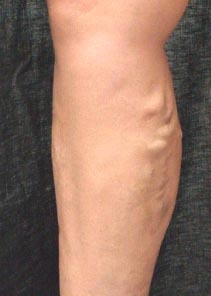 Superficial or Deep Venous Thrombosis.